In the early years of the fifteenth century, Filippo Brunelleschi was the young architect at the forefront of Italian Renaissance architecture. He was the leader of a group of young Italian Renaissance artists who became intent on creating a new art and to break with the ideas of the past. He was born in 1377 in Florence and trained as a goldsmith and metalworker. Filippo had been educated with the intention of following in his father's footsteps as a lawyer he also studied Mathematics and literature. His artistic inclination saw him enter a competition to design a new set of bronze doors for the baptistery in Florence. Another young goldsmith, Lorenzo Ghiberti, was Brunelleschi's main rival for this work and in 1403 Ghiberti was announced the winner. Ghiberti's technical skill was superior and his test bronze had been completed in one piece, Brunelleschi's effort had been cast in several pieces and then bolted together. Brunelleschi was so influenced by ancient Roman ruins that he and his friend, Donatello, travelled to Rome to study them completing many measurements and drawings on their journey. The young artists drew inspiration from these classical Roman buildings without being slavishly bound by them. The Dome of Florence Cathedral. 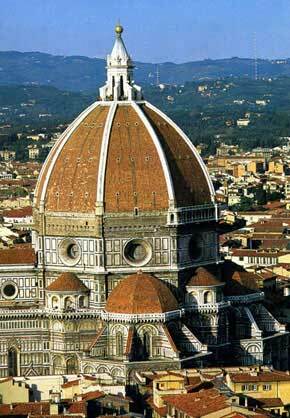 In 1419 Filippo was given the task of completing the dome for the Cathedral of Florence. This work occupied a great deal of Brunelleschi's life and the challenge was enormous, no dome of that size had been built since antiquity. 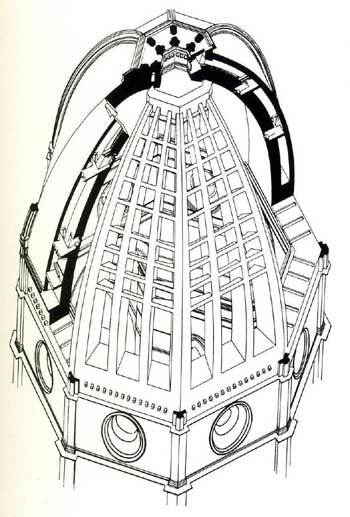 The dome became not only an architectural problem, but also demanded great engineering skill and Filippo invented, and patented, a new hoisting machine for raising the masonry required for the dome. Work began in 1420 and was completed in 1436. The dome contains over 4 million bricks and the structure rests on a drum, not on the roof itself, this allowed the dome to be built without the need for scaffolding from the ground. The two shells of the dome are supported by ribbed reinforcements and are joined by horizontal and vertical struts through which the staircase weaves it's way to the top of the structure. The base of the dome is tensioned by horizontal chains of iron and wood. (The elders of Florence had forbidden the use of external buttresses, and this was a part of the architect's solution to the problem). The cathedral dome still dominates the skyline of Florence today, it remains as a lasting testament to a great architect. Visit if you can Florence is a magnificent city. If you look at the cupola (right) it's just possible to see the visitors at the top of the dome this gives some idea of the huge scale of the building. Loggia of Ospedale degli innocent. Brunelleschi increasingly turned his attention away from the trade of the goldsmith to concentrate exclusively on architecture. 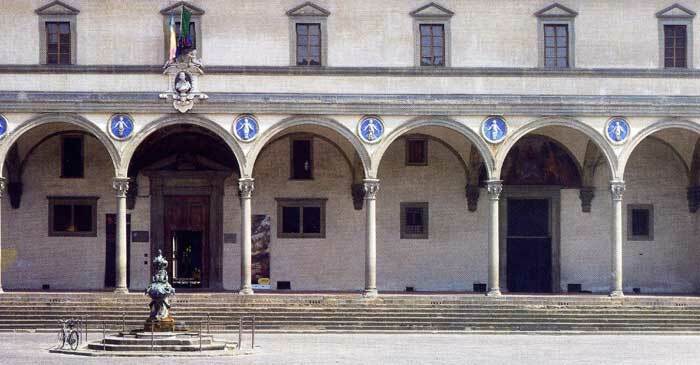 The Loggia of Ospedale degli Innocenti was to be his first major commission. 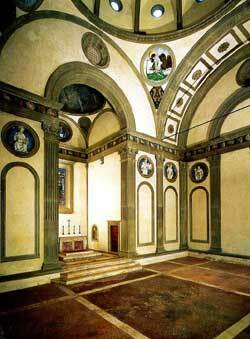 The "hospital of the innocents" was originally an orphanage overseen by the powerful Silk Guild of Florence. Fillippo based his design on Classical Roman and Gothic architecture and certainly, a building such as this had never before been seen in crowded Florence. The Loggia fronts the building its balance and elegance is captured in its slim columns with Corinthian capitals supporting arched arcades. The arcade spandrels are decorated with blue-coloured terracotta medallions created by the sculptor Andrea della Robbia. 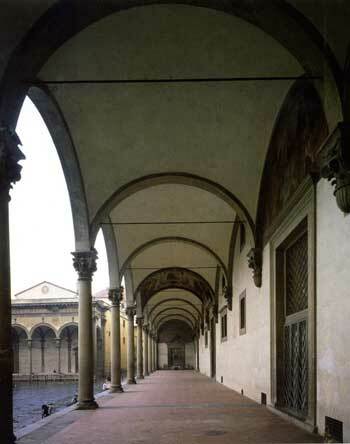 This view of the Loggia highlights the clean, classic lines in addition to the vaulted structure of the building. 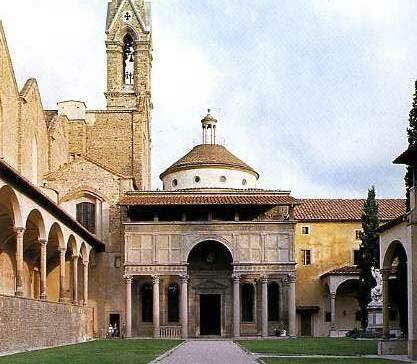 The Capella dei Pazzi in Florence is an early Renaissance church built by Filippo for the powerful Pazzi family. Although the building was completed in 1470 long after the architect's death, it is considered to be a masterpiece of Renaissance architecture. 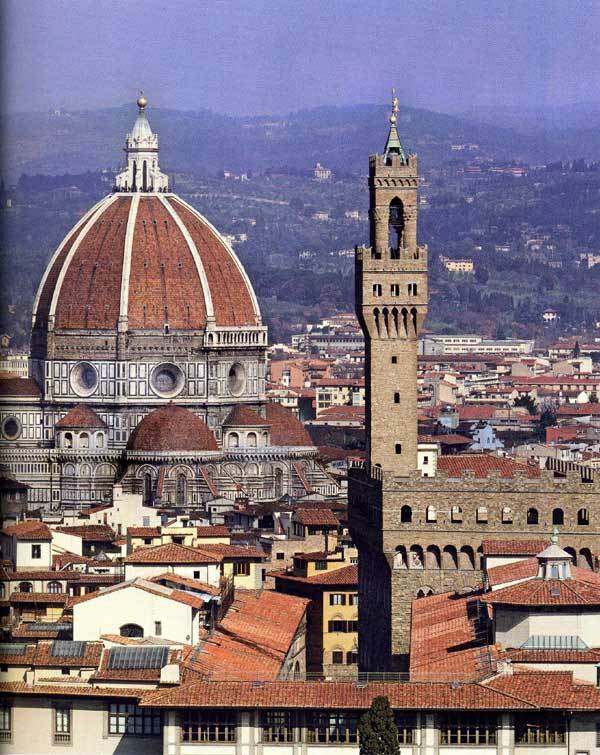 Brunelleschi died on April 15th 1446 and is buried in Santa Maria del Fiore (Florence Cathedral) his legacy is that for five hundred years architects from America and Europe followed in his footsteps.